Whether you're using a smartphone, tablet, or computer, a click or two is all you'll ever need to check in. Connect up to 15 cameras to the cloud. Watch up to four cameras at once. Automate motion detection schedules to fit your lifestyle. Arlo has everything it takes to make safe simple. Move Arlo where you want it . Unlike any other security system, Arlo wireless cameras can be moved around with ease. Napping baby? Place one over their crib. Going away for the weekend? Move the camera to the front door. Trying to find out who's been messing up the kitchen at night? Arlo can tell, even in total darkness. Arlo braves the outdoors, so you won't have to. Weatherproof and wireless, Arlo cameras see who’s coming up the driveway, knocking at the door, or out in the yard. With the Arlo mobile app in your pocket, you don’t have to be home to know who’s there. From kids and pets to an empty home or after-hours business, you’ve got a lot to keep safe. Arlo Pro takes the worrying out of life with its 100% wire-free indoor/outdoor home monitoring system that eliminates the need for cords or electrical outlets. It uses rechargeable batteries that can be swapped in a flash minimizing camera downtime to help you stay protected. Arlo Pro brings a balance of form and features - from 7 days of free cloud HD video recordings to motion and sound-activated alerts and a 100+ decibel siren, Arlo covers every angle to help keep your home safe and protected. Peace of Mind. Anytime. Anywhere. Arlo Pro security cameras lets you watch over what you love from every angle, indoors and out, day and night. Arlo records motion or sound-triggered events and saves them in your cloud Library to be viewed, downloaded, and shared for 7 days, for FREE..
ings from the past 7 days. And the plan never expires! 130° viewing angle See more of every moment with a 130° wide-angle lens. Rechargeable Long lasting rechargeable batteries take the expense out of uninterrupted security. 2-way audio Listen in and talk back through the built-in speaker and mic, straight from your smartphone. Advanced motion detection Wide-angle PIR motion sensor makes sure no movement will slip through without your notice. Night vision Integrated night vision automatically switches on at night to shed light on the smallest wonders. Flexible powering options Use it wire-free or plugged in. The choice is yours. No WiFi, No Worries. Arlo Go runs on LTE. The Arlo Go Mobile Security Camera is ideal for security monitoring when travelling or in areas with limited or no WiFi access. Arlo Go works anywhere there are compatible 3G/4G LTE mobile networks available. This allows you to keep an eye on trails, campers, or your cabin from anywhere, even far away from the nearest power socket or WiFi connection. 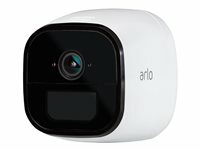 Get instant alerts if motion or sound is detected using the free Arlo app and watch live or recorded videos from your computer, smartphone, tablet or your TV. The Arlo app makes it easy to view, download and share cloud recordings. Additionally, the micro SD card port provides local video recording in case of Internet interruptions. Arlo records motion or sound-triggered events and saves them in your cloud library to be viewed, downloaded and shared for 7 days for FREE. Why commit to a long-term contract or pay expensive monthly subscription fees? Arlo can save you hundreds of pounds a year. The Arlo Basic plan gives you access to motion and audio triggered recordings from the past 7 days. And the plan never expires! 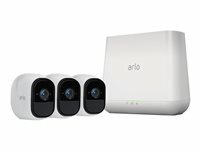 The Arlo Basic plan is included with every camera, for up to 5 cameras per account. Arlo Pro 2 Wire-Free HD Camera Security System Your browser does not support HTML5 video. Peace of Mind. Anytime. 1080p HD quality means you get videos with sharper details so you can see your home and everyone around it in more brilliant detail than ever before, day or night. No matter where you are.